The saintly Queen Kunti knew well that crisis evokes our sense of dependence on divine mercy. She endured assassination attempts, multiple plots to kill her sons, and then all-out war, and her prayers show that even the most extreme situations can be beneficial, since prayer unites us with God. Queen Kunti is a major figure in the history of the ancient world. As mother of the warrior Arjuna—to whom Krishna spoke the Bhagavad-gita—she appears again and again in historical epics such as the Mahabharata and Srimad-Bhagavatam as the saintly matriarch of a great dynasty torn apart by fratricidal war. Like many noble personalities of Vedic times, Kunti devi understood Krishna to be the Supreme Person, the cause of all causes, Who had appeared at that time as her nephew. At the conclusion of the devastating battle of Kurukshetra, Queen Kunti approaches Krishna as He prepares to depart for his home city of Dwaraka. Kunti's spontaneous glorification of Krishna and her description of the spiritual path consist of twenty-six couplets (Srimad-Bhagavatam, Canto One, Chapter Eight, verses 18-43), and have been recited, chanted, and sung by sages and philosophers for thousands of years. Chapter 21: What Is Our Actual Value? Pandu became king because his elder brother Dhritarashtra had been born blind, a condition that excluded him from direct succession. Some time after Pandu ascended to the throne, Dhritarashtra married Gandhari and fathered one hundred sons. This was the ruling family of the Kaurava dynasty, of whom the eldest was the ambitious and cruel Duryodhana. Meanwhile, Pandu had taken two wives, Madri and Kunti. Originally named Pritha, Kunti was the daughter of Surasena, the chief of the glorious Yadu dynasty. The Mahabharata relates that Kunti "was gifted with beauty and character; she rejoiced in the law [dharma] and was great in her vows." She also possessed an unusual benediction. When she was a child, her father Surasena had given her in adoption to his childless cousin and close friend Kuntibhoja (hence the name "Kunti"). In her stepfather's house, Kunti's duty was to look after the welfare of guests. One day the powerful sage and mystic Durvasa came there and was pleased by Kunti's selfless service. Foreseeing that she would have difficulty conceiving sons, Durvasa gave her the benediction that she could invoke any demigod and by him obtain progeny. After Kunti married Pandu, he was placed under a curse that prevented him from begetting children. So he renounced the throne and retired with his wives to the forest. There Kunti's special benediction enabled her to conceive (at her husband's request) three glorious sons. First she invoked Dharma, the demigod of religion. After worshiping him and repeating an invocation Durvasa had taught her, she united with Dharma and, in time, gave birth to a boy. As soon as the child was born, a voice with no visible source said, "This child will be called Yudhishthira, and he will be very virtuous. He will be splendid, determined, renounced, and famous throughout the three worlds." Having been blessed with this virtuous son, Pandu then asked Kunti for a son of great physical strength. Thus Kunti invoked Vayu, the demigod of the wind, who begot the mighty Bhima. Upon Bhima's birth the supernatural voice said, "This child will be the foremost of all strong men." Thereafter Pandu consulted with great sages in the forest and then asked Kunti to observe vows of austerity for one full year. At the end of this period Pandu said to Kunti, "O beautiful one, Indra, the King of heaven, is pleased with you, so invoke him and conceive a son." Kunti then invoked Indra, who came to her and begot Arjuna. As soon as the prince was born, the same celestial voice boomed through the sky: "O Kunti, this child will be as strong as Kartavirya and Shibi [two powerful kings of Vedic times] and as invincible in battle as Indra himself. He will spread your fame everywhere and acquire many divine weapons." Subsequently, Pandu's junior wife Madri bore two sons named Nakula and Sahadeva. These five sons of Pandu (Yudhishthira, Bhima, Arjuna, Nakula, and Sahadeva) then came to be known as the Pandavas. Now, since Pandu had retired from the throne and gone to the forest, Dhritarashtra had temporarily assumed the throne until Pandu's eldest son Yudhishthira came of age. However, long before that time Pandu died as a result of the curse, and Madri gave up her life as well by ascending his funeral pyre. That left the five Pandavas in the care of Queen Kunti. After Pandu's death, the sages living in the forest brought the five young princes and Kunti to the Kaurava court at Hastinapura (near present-day Delhi). In Hastinapura, the capital city of the kingdom, the five boys were raised in royal style under the guidance of Dhritarashtra and the noble Vidura, Pandu's half brother. But a smooth transfer of power was not to be. Although Dhritarashtra had at first recognized the primogeniture of Yudhishthira, he later allowed himself to be used by his eldest son, the power-hungry Duryodhana, who wished to ascend the throne in place of Yudhishthira. Driven by uncontrollable jealousy, Duryodhana plotted against the Pandavas, and with the hesitant approval of the weak Dhritarashtra, he inflicted many sufferings upon them. He made several attempts on their lives in Hastinapura, and then he brought them to a provincial palace and tried to assassinate them by having it set on fire. All the while, the five youthful Pandavas were accompanied by their courageous mother Kunti, who suffered Duryodhana's atrocities in the company of her beloved sons. Miraculously, however, Kunti and the Pandavas repeatedly escaped death, for they were under the loving protection of Lord Krishna, who had incarnated to perform His earthly pastimes. Ultimately Duryodhana, a clever politician, cheated the Pandavas out of their kingdom (and their freedom) in a gambling match. As a result of the match, the Pandavas, wife Draupadi was abused by the Kauravas, and the Pandavas themselves were forced to spend thirteen years in exile in the forest—to the great sorrow of Kunti. When the thirteen-year exile had ended, the Pandavas returned to Hastinapura to reclaim their kingdom. But Duryodhana bluntly refused to relinquish it. Then, after some unsuccessful attempts to quell the hostilities, Yudhishthira sent Krishna Himself to secure the return of the Pandava kingdom by peaceful means. But even this effort failed—because of Duryodhana's obstinacy—and both sides prepared for battle. To place Yudhishthira on the throne—or to oppose him—great warriors from all corners of the earth assembled, setting the scene for what would prove to be a devastating world war. Fierce fighting raged for eighteen days on the historic plain of Kurukshetra (near Hastinapura), and in the end all but a handful of the many millions of warriors were dead. Only Lord Krishna, the Pandavas, and a few others survived the massacre. The Kauravas (Duryodhana and his brothers) were devastated. In a desperate gesture of revenge, Ashvatthama, one of the surviving Kauravas, mercilessly murdered the five sons of Draupadi while they were sleeping. Queen Kunti thus suffered a final blow—the loss of her grandchildren. Arrested and dragged to the Pandavas' camp like a bound animal, Ashvatthama was let free only by the astounding compassion of Draupadi, the slaughtered boys' mother and Kunti's daughter-in-law, who pleaded for his life. But the shameless Ashvatthama made one more attempt to kill the last heir of the Pandavas, their unborn grandson in the womb of Uttara, by hurling the supreme brahmashtra weapon. When she saw the missile flying straight at her, Uttara immediately ran to the shelter of Lord Krishna, who was just about to depart for Dvaraka, His majestic capital city. Krishna protected the Pandavas and their mother Kunti from imminent death by stopping the weapon's uncontrollable heat and radiation with His own Sudarshana disc. Having delivered the Pandavas from this last calamity, and seeing that all His plans were fulfilled, Lord Krishna was again preparing to leave. For years Duryodhana had tormented Queen Kunti's family, but Krishna had protected them at every turn—and now He was going away. Kunti was overwhelmed, and she prayed to Krishna from the core of her heart. Whenever and wherever there is a decline in religious practice, O descendant of Bharata, and a predominant rise of irreligion—at that time I incarnate Myself. In order to deliver the pious and annihilate the miscreants, as well as to reestablish the principles of religion, I advent Myself millennium after millennium. Krishna had accomplished His purpose of "annihilating the miscreants" by orchestrating the destruction of the unholy Kauravas. Then He installed Yudhishthira on the throne to establish the Pandava reign, and He consoled the slain warriors' relatives. The scene of the Lord's imminent departure provides the setting for Queen Kunti's exalted prayers. As they appear in the First Canto of the Bhagavatam, Queen Kunti's celebrated prayers consist of only twenty-six couplets (verses 18 through 43 of the Eighth Chapter), yet they are considered a philosophical, theological, and literary masterpiece. The present book (Teachings of Queen Kunti) includes those inspired verses and illuminating commentary by His Divine Grace A.C. Bhaktivedanta Swami Prabhupada, Founder–Acharya of the International Society for Krishna Consciousness and the most renowned Vedic scholar and spiritual leader of our time. In addition to this commentary (originally written in 1962), Teachings of Queen Kunti contains further explanations that Srila Prabhupada gave more recently in an absorbing series of lectures. In those memorable talks, delivered in the spring of 1973 at ISKCON's Western world headquarters in Los Angeles, he analyzed the verses in significantly greater detail and shed even more light upon them. This new Bhaktivedanta Book Trust publication, complete with eleven color prints of exquisite original oil paintings, will be a prized addition to the libraries of all those who seek a deeper understanding of life's mysteries. Written by a man of profound devotion and erudition, it will provide every reader with firm guidance along the universal path to genuine wisdom and spiritual enlightenment. "The books of Srila Prabhupada are to be treasured. No one of whatever faith or philosophical persuasion who reads these books with an open mind can fail to be both moved and impressed." "The Bhaktivedanta Book Trust editions of famous religious classics of India with new translations and commentaries are an important addition to our expanding knowledge of spiritual India." "The philosophical and religious works published by the Bhaktivedanta Book Trust provide a golden opportunity to Western philosophers, scholars, and people in general to drink deep at the celestial fountain of ancient Indian philosophical and spiritual wisdom." The tragic and heroic figure of Queen Kunti emerges from an explosive era in the history of ancient India. As the wife of King Pandu and the mother of five illustrious sons (the Pandavas), she was a central figure in a complex political drama that fifty centuries ago culminated in the devastating Kurukshetra war. At the conclusion of the war, Queen Kunti approaches Lord Krishna as He prepares to depart the scene of the battle. Although Kunti is Lord Krishna's aunt (He incarnated as her brother Vasudeva's son), she perfectly understand His exalted and divine identity as the Supreme Personality of Godhead. She knows full well that He descended from His abode in the spiritual world to rid the earth of demoniac military forces and reestablish peace and righteousness. Thus the prayers she offers Him on this occasion are not the conventional pious solicitations. Rather, they are philosophical reflections, devotional illuminations, even mystical exultations. As such they have been recorded and immortalized in the Srimad-Bhagavatam, Indian's greatest philosophical and spiritual classic. 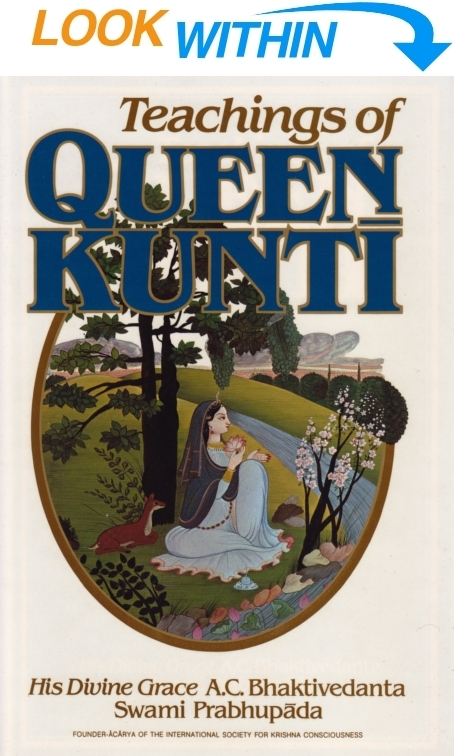 Queen Kunti's prayers—the simple and illuminating outpourings of the soul of a great and saintly woman devotee—reveal both the deepest transcendental emotions of the heart and the most profound philosophical and theological penetrations of the intellect. Her words have been recited, chanted, and sung by sages and philosophers in India for thousands of years.